While domesticated life with the peanut and the life partner has been the best thing that has ever happened in my life, the weeks and weekends do fly by. It is easy to forget that as a couple we did have lives before, and the chance to steal a vacation came at a very, very good time. The family vacation portion took us to Kennebunkport, Maine while we left the peanut with the grandparents to head to Acadia National Park. There is no doubt Kennebunkport is picturesque. When you go in the summertime, what you get is an idyll by the beach, with lots of rich houses and compounds (like the Bush’s, which more than one person randomly asked us about). It is beautiful, picturesque and – clearly geared for tourism. Indeed the town square did not just look like Classic New England, it looked like the Classic New England you would have expected Epcot Center to have captured. 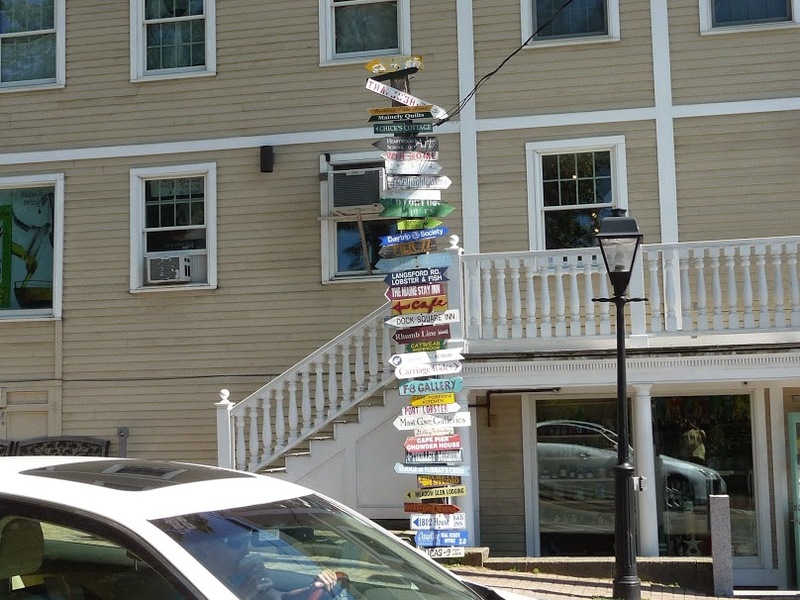 You have the place to get fried clams and lobstah rolls, signs pointing to other tourist attractions in the area – clearly this is not built to be residential. Put simply, it was cheesy, but fun. As far as a couple of the famous tourist spots? Rococo’s Ice Cream: Allegedly the #6 Ice Cream place in the country. Certainly they try hard with the flavors and variety. At the same time, just because the artisan flavor were cute doesn’t mean they were good. No complaints about texture, but my Coffee-Bourbon was a bit boozy, and the Cardamom Chai Ice Cream had tea grounds in it, which was probably meant as a textural contrast but seemed rough. The sample of Spicy, Smoky Blueberry was not tried by me, but the life partner found it repulsive. This was a major disappointment. The place next door which served Graeter’s was a welcome break. 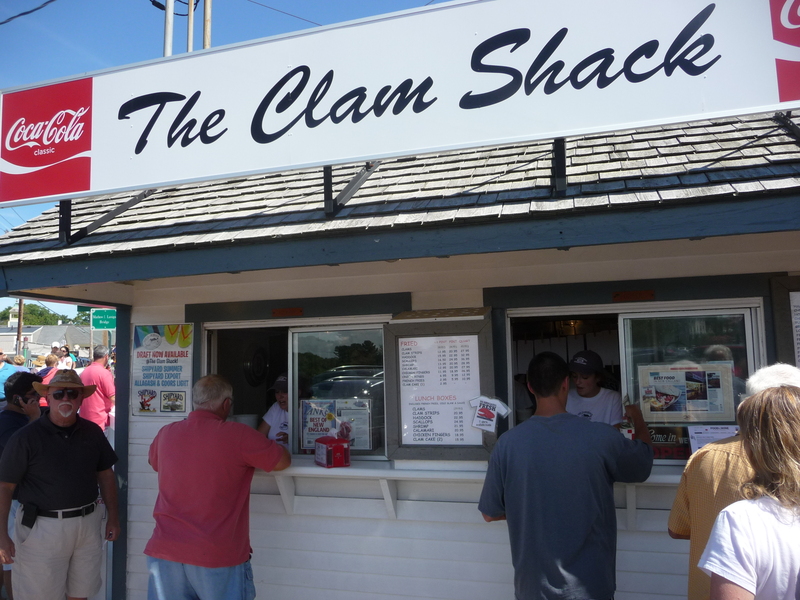 The Clam Shack: By contrast, this lived up to the promise and the long lines. Yeah, yeah, yeah this is touristy fluff. But the whole belly clams were outstanding, as was the Lobster Roll (no skimping on meat, and not overdressed). In fact, the Clam Cake, something which I was not familiar with – worked too, with good clam favor and a lack of filler – assuming applying a crab cake grading process is the right way to go. Fortunately, a respite from the tourist trap is available up the highway in neighboring Kennebunk. I read about a place to pick blueberries, but was expecting a marked area. Instead, it was just preserved area off the road – the only reason we stopped was because we saw other people there. The bounty was pretty phenomenal. Blueberries were everywhere – and in the 30 minutes or so we took, we filled a couple of bottles with blueberries and could have filled a lot more. Maine blueberries of course, are smaller and sweet – perfect for baking, as the muffins we had later proved. It’s everywhere. Do it.